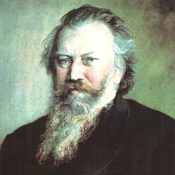 Johannes Brahms (pronounced [joˈhanəs ˈbʁaːms]; 7 May 1833 – 3 April 1897) was a German composer and pianist. Born in Hamburg, Brahms spent much of his professional life in Vienna, Austria, where he was a leader of the musical scene. In his lifetime, Brahms's popularity and influence were considerable; following a comment by the nineteenth-century conductor Hans von Bülow, he is sometimes grouped withJohann Sebastian Bach and Ludwig van Beethoven as one of the "Three Bs". Brahms composed for piano, chamber ensembles, symphony orchestra, and for voice and chorus. A virtuoso pianist, he premiered many of his own works; he worked with some of the leading performers of his time, including the pianist Clara Schumann and the violinist Joseph Joachim. Many of his works have become staples of the modern concert repertoire. Brahms, an uncompromising perfectionist, destroyed many of his works and left some of them unpublished.